Congratulations to Bruno Véras who received the Antonieta de Barros award for the promotion of racial and gender equity in Brazil. 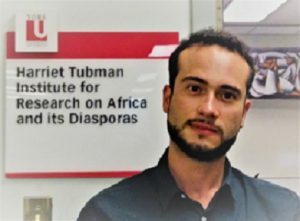 Bruno is a PhD student in the Department of History and was the director of the project, “África Aparece: Linguagem, Ensino Debates sobre a Cultura Afro-Brasileira” (Africa displayed: Language, Education and debates on the Afro-Brazilian Culture). In recognition of the successful impact it has had on the community, the project won R$ 20,000 (reais) from the Secretariat for the Promotion of Racial Equality (Ministry of Women, Racial Equality and Human Rights). África Aparece received initial funding from the Ministry of Education and Culture in Brazil and advisory support from the Harriet Tubman Institute, York University. Based in the Zequinha Barreto State Public School, África Aparece promoted Afro-Brazilian culture, stimulated positive memories of Africa, and enhanced self esteem among the black youth in the the community of Dom Hélder Câmara in Pernambuco, Northeastern Brazil, through a series of workshops on photography, plastic arts, film screenings and educational exhibits. Click here to access the project website and social media. Posted in Graduate Student News, News.